A graveside committal service will be held for Leo “Roy” Buss on October 6, 2018 at 12:30 p.m. at the Whiteshell Baptist Church Cemetery, 69069 Provincial Rd 408, RM of Whitemouth. A luncheon will follow at 2 p.m. at the Superior Inn in Beausejour, MB. At age 81, Roy passed away in Calgary, AB. He was born to John and Lydia Buss and raised in Whitemouth, MB. 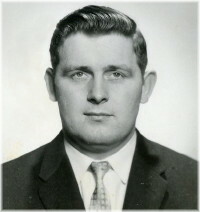 He married Betha (Betty) Krebs in Winnipeg in 1958. After moving his young family to Calgary in 1963, he worked as a millwright before developing his business, Action Septic Tank. In retirement, he kept busy with various business interests, his church, curling and travelling. Roy worked hard, had a mischievous wit, and loved his family and friends. He is survived by his daughters, Karin (John), Susan (Dave), and Doris (Jo); his close friend Betty Meyer, his sister Esther Melnick, brothers John (Joan), Ron (Sharon), Charlie (Irene) and David (Bev); and nieces and nephews. Roy was predeceased by his sister Edna Anderson (Arne), his brothers Norman and Berthold; his sister-in-law Bernice Buss, and brother-in-law Tom Melnick.